Looks like Netflix isn’t splitting off their DVD division after all. I’d bet the damage is done. Lots of people went to Redbox. If they lower their DVD rental price back to close to what it was before they might get people back. For people that rent recent run movies, and were keeping the Netflix DVDs for any length of time (say a week or two), Redbox is a better deal. G4’s X-Play is listing the Top 7 Video games for Fans of LOST. Top titles include Lost in Blue, Trauma Center: Second Opinion and more! The Supreme Court ruled today that Cablevision Systems Corp remove DVR technology does not violate copyright law. That means cable companies will be able to offer consumers to have DVR technology without actually having to have a box in their homes. I’m not sure this is really going to make a difference, in the long run. TiVo and other DVRs are great to have in the home, and it’s nice to have some control over what you’re recording, rather than leaving it to the cable companies. Also, it seems unlikely that the cable companies that make money every month from in-home DVR subscriptions will want give that up. AT&T has announced CruiseCast, a service that will allow you to watch TV in the back seat of your car. Sounds like a good idea, right? The catch: $1299 for the receiver, probably about between $150 to $200 for professional installation and $28 per month for a subscription. Good idea, bad price. I’m going to pass on this one. A DVD player and a movie will do the job. Looks like DISH Network is going to have to work out a settlement with TiVo, or risk having some DISH customers lose access to their DVR capabilities. Read more about this ruling in the Wall Street Journal. As this is an entertainment blog, and not just one about TV (or just “24” or “LOST”), I thought I’d mention that Amazon’s Kindle 2 was released today, If you pre-ordered it, it’ll show up in the next day or two. What’s a Kindle, and why would you want one? It’s an electronic book reader, but it’s quite a bit more than that. The device has a built-in cell radio that let’s you download content no matter where you are. The key things about that feature are 1) You don’t have to pay monthly fees, so once you buy it, that’s it; 2) You can download new books, sometimes at a substantial discount from Amazon and have them go straight to your Kindle; 3) You can download more than just books – magazines, blogs and newspapers are also available! If you’re interested, take a look at the Kindle Video to find out more. I’m going to try something new tonight. I had the overwhelming urge to talk about LOST with folks while the show was running, and didn’t do anything on the blog about it. So, this week, I’m going to use Twitter to live blog LOST. If you’re a Twitter subscriber, please join. If you’re not, follow along! My Twitter name is MagicLampTV. 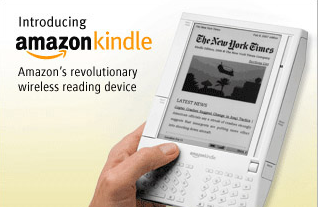 Amazon Kindle: Your new e-book reader? Amazon.com has released the Kindle just in time for the holidays. The device has a battery life that lasts for days, gets wireless EVDO delivery of content, and has a crisp black and white screen… all this in a device that weights 10.3 ounces. You can read blogs on it, get newspaper and blog content delivered to it, it has a keyboard. It’ll even fully recharge in 2 hours. The key thing about the device I think is that there are no wireless bills, service plans or commitments. If they had charged a monthly fee, I think that would have killed the device. Now, if you want to get your own personal files or pictures on the device, you can e-mail them for $0.10. I’m not sure why there would be a charge for that, but not the other online content. Check out Amazon’s Kindle page for a lot of info and video. What do you think? Would you buy one? Update Looks like you’ll be changed $1.99 per blog per month. Here is a Jini Pumpkin I carved a few years ago..
Roboquad – Is this the big Christmas gift this year? I saw a demo of the Roboquad , a new $99 robot from WowWee. This four-legged robot looks very cool, and it moves around autonomously. Author srpPosted on September 28, 2007 Categories Technology1 Comment on Roboquad – Is this the big Christmas gift this year?